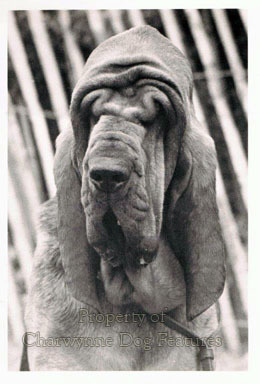 In every decade, in the world of the pedigree dog, the faddists are at work, sadly in far too many breeds. 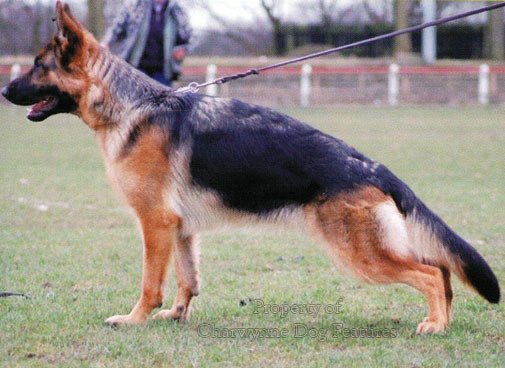 German Shepherd Dogs, in the days when they were still called Alsatians, were famed for their level toplines and their ability to maintain that topline on the move. The saying was that a glass of water placed on the back of an Alsatian would not be spilt when the dog moved. In more recent times we have banana-backed German Shepherd Dogs valued for their ability to 'gait' at speed whilst apparently lacking the capability to walk soundly. 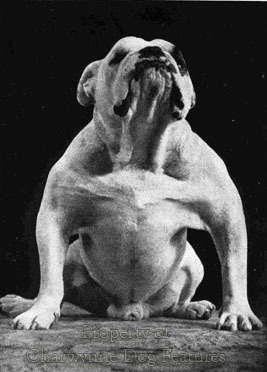 Bulldogs were once actually prized for being 'out at elbow', for having ludicrously barrel-chested rib cages and relatively gigantic heads. Now they seem to be prized for being just about muzzleless. 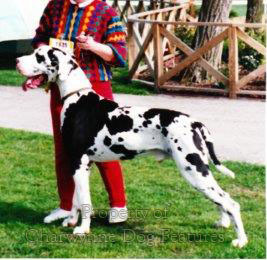 The giant breeds are often desired to be too big, with health and soundness overlooked. 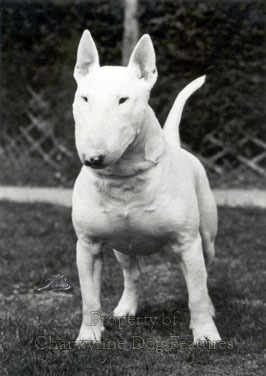 The head of our Bull Terrier was once strong and unexaggerated -- before the craving for 'downface' manifested itself. It seems quite bizarre to want a fine breed like this to display piggy eyes and possess a ruggerball for a head. In breed after breed, enthusiasts seek massive bone in their dogs despite the health penalties this brings. Bloodhound fanciers seem to admire excessively loose skin despite the historical inaccuracy of this feature. Sporting dogs, like the Setters, were once famed for their lung power; now they are uniformly slab-sided in the chest, despite the evidence that such a structure enhances the likelihood of bloat. A Cocker Spaniel can, it appears win Best in Show at Crufts with ears which defy the breed standard. Fads may be passing indulgences for fanciers but they so often do lasting harm to breeds. If they did harm to the breeders who inflict them, rather than to the wretched dogs who suffer them, fads would be more tolerable and certainly more short-lived. But what are the comments of veterinary surgeons who have to treat the ill-effects of misguided fads? 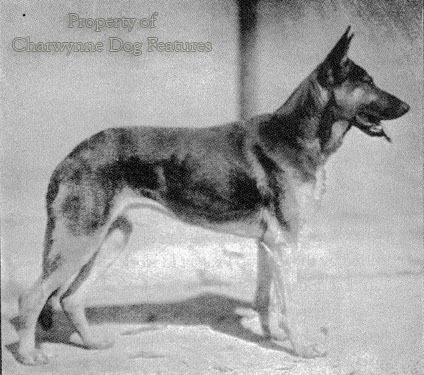 In his informative book "The Dog: Structure and Movement", published in 1970, R.H.Smythe, a vet and exhibitor, wrote: "...many of the people who keep, breed and exhibit dogs, have little knowledge of their basic anatomy or of the structural features underlying the physical formation insisted upon in the standards laid down for any particular breed. 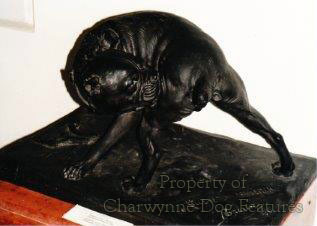 Nor do many of them -- and this includes some of the accepted judges -- know, when they handle a dog in or outside the show ring, the nature of the structures which give rise to the varying contours of the body, or why certain types of conformation are desirable and others harmful." Having watched the judging at the 1998 Crufts on Working Group Day, I can see why such words were forthcoming. Having gone to my first dog show just about fifty years ago, I feel, with enormous concern, that things are getting worse rather than better. In his book, Smythe goes on to say that "...the same may sometimes be written regarding those whose duty it is to formulate standards designed to preserve the usefulness or encourage the welfare of the recognised breeds." Encouraging the welfare of the recognised breeds has to be the underlying mission of not just the Kennel Club, whom Smythe is pointedly criticising, but every breeder, every breed club and every judge officiating at dog shows. Of course it is deeply depressing to observe at Crufts, a Pointer win not just its breed ticket but the group one too when it displays a Hackney action, forbidden in its breed standard. 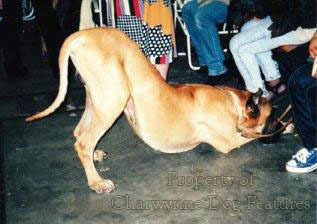 It is tiresome to see yet another Bullmastiff get its breed ticket at Crufts demonstrating extremely poor hind movement. It is even sadder to see the Best in Show there clearly afflicted by a luxating patella in its right hind leg. If this is "the best of the very best" as the 1998 Crufts slogan assured us, God help the mongrels of England! 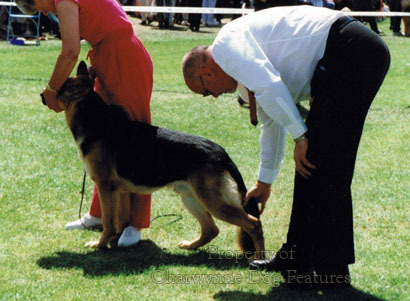 There would be enormous merit in dogs at KC-licensed shows being judged on movement alone for a few years, especially in the so-called 'head' or 'coat' breeds; at least it would result in the winning dogs being able to walk properly! 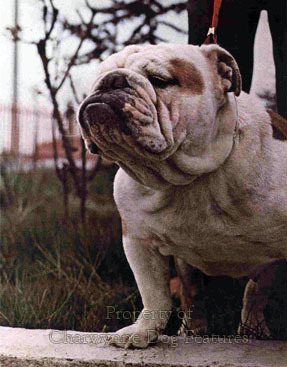 The relentless pursuit of a muzzleless Bulldog by contemporary breeders leads to distress in the dog. 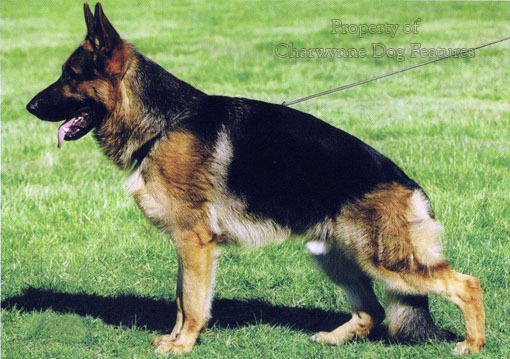 The vomer bone in this breed may be incomplete or more deeply notched at its front end than is desirable and this interferes with the suspension of the soft palate, giving rise to difficulty in breathing, especially in hot temperatures. This condition is often compounded by faulty development of the sphenoid bone, increasing the discomfort to the dog. At the World Dog Show a couple of years ago I saw a Bulldog collapse in the ring on a really hot day, be carried out of the ring by its handler, wrapped in cold wet towels for a while and then brought back into the ring, only to collapse again. Does such a person really love Bulldogs? In the Chihuahua there is quite often a centrally located small hole, slightly above eye level, in the upper surface of the cranium. This lies over the long but tiny gap between the two parts of the cerebrum. When this hole or space is particularly well sized then even finger pressure may damage the dog's brain. What a perpetual threat to the life of a tiny dog and what a source of worry to any novice owner. Why breed from dogs with such a potentially lethal feature? 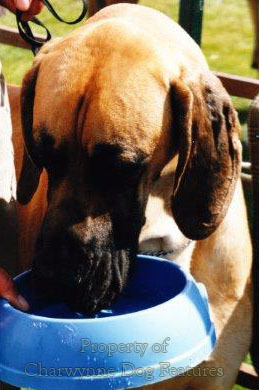 In the short-faced Toy breeds the sagittal crest is underdeveloped; the strength of bite coming mainly from the masseter muscle. 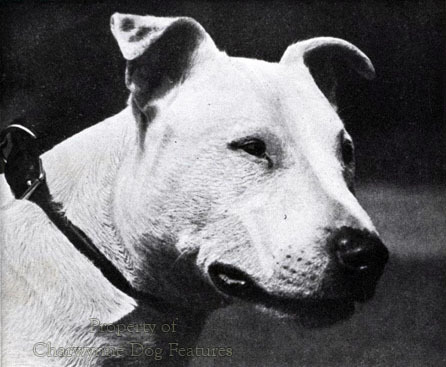 A well developed masseter produces large cheeks, as the Bull Terrier demonstrates. 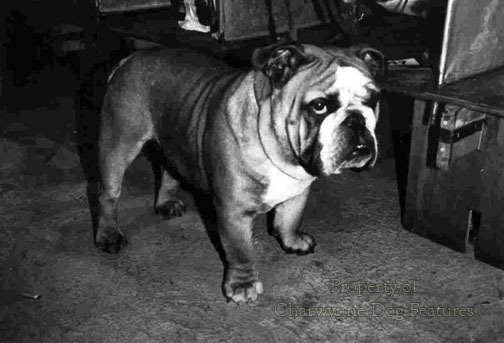 If the short-faced Toy breeds are bred with an ineffective masseter muscle and this becomes an inbred feature, the dogs of this group of breeds face a long term future without the ability to chew a bone. A human being might live happily without such a capability but do we really want to own dogs that cannot even enjoy a bone? The gundog breeds carry surprisingly heavy items of shot game in their mouths using their temporal muscles ahead of their masseter muscle. This results in a soft mouth. Marked cheek development is undesirable in any gundog breed if the soft-mouthed virtue is to be retained. But I see many Labradors with the head and cheek muscles of a Rottweiler. I doubt very much if such a Retriever also displays a soft mouth. I worry too about some gundog breeds beginning to feature too deep a stop; cleft palates and very deep stops all so often go together. Why seek a feature which can harm the dog? The jaws of so many breeds have fallen victim to thoughtless show points or perhaps breed points not thought through. Breeds ranging from the Poodle to the Chihuahua now have too narrow a jaw, too narrow that is to find space for the correct number of teeth. Conversely, broad-mouthed breeds like the Bulldog and the Boxer frequently display too many incisor teeth in both lower and upper jaw, as nature fills the unnatural width of mouth. Outward appearance impresses the judge but a faulty mouth does the possessor no good at all. Internal soundness is mainly a moral issue for breeders but it also needs special attention from the more perceptive judges. We can stretch the jaw in width and length and the dog can still live a reasonably happy life. But when we seek to 'stretch' the hindquarters the consequences are much more worrying. We are then affecting the dog's ability to move as well as the best interests of its bone structure. 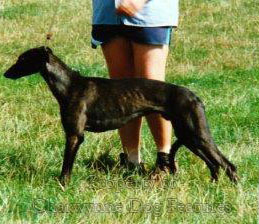 Why does a show Greyhound need extensive angulation in the stifle when a successful racing Greyhound triumphs with relatively straight stifles? 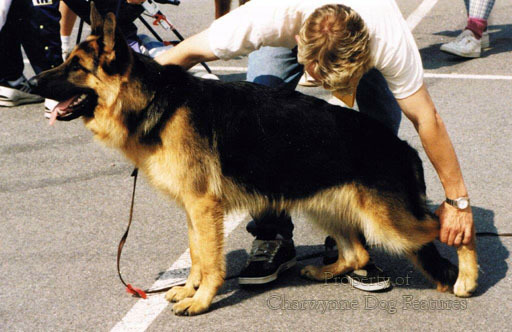 Why should a German Shepherd Dog in the 1980s suddenly need different hindquarters from all its ancestors? Why should the Weimaraner need longer upper hind legs than the other 'hunt, point and retrieve' breeds? Inequality between the length of the rear stride and the length of the front stride is producing ugly unsound movement in an ever increasing number of breeds as the contemporary fad for hyper-angulation in the hindquarters gathers more and more momentum. In the Dachshund the hind feet have difficulty keeping tally with the front ones. This, combined with inflexibility in the spine, produces a failure of synchronisation behind. In soundly constructed dogs sufficient angulation in the hindquarters and adequate length in the tibia enables the hock to flex and the hind foot to advance beneath the body enough so that balance is maintained. The side effects of excessive angulation in the hindquarters of a number of pedigree breeds are increasingly manifesting themselves. Why then is it becoming almost 'de rigueur' in breeds like the Boxer, the Dobermann, the show Greyhound, the Great Dane and the show Whippet? In every animal walking on four legs the force derived from pressing the hind foot into the ground has to be transmitted to the pelvis at the acetabulum, and onwards to the spine by way of the sacrum. In over-angulated dogs the locomotive power is directed to an inappropriate part of the acetabulum. In addition, so as to retain the required degree of rigidity of the joint between the tibia and the femur, other muscles have to come into use. In the over-angulated hind limb, the tibia meets the bottom end of the femur at such an angle that direct drive cannot ensue. The femur can only transmit the drive to the acetabulum after the rectus femoris muscle has contracted, enabling the femur to assume a degree of joint rigidity when connecting with the tibia. This means that the femur rotates anticlockwise whereas nature intended it to move clockwise. Excessive angulation in the hindquarters, with an elongated tibia, may, to some, give a more pleasing outline to the exhibit when 'stacked' in the ring. But, in the long term, it can only lead to anatomical and locomotive disaster. 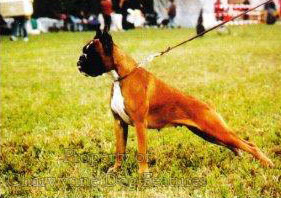 Such angulation destroys the ability of the dog's forelimbs and hindlimbs to cooperate in harmony in propelling the body. Yet I have heard it argued by breed specialists at seminars that it will increase the power of propulsion operating through the hindlimbs and on through the spine. If it did, the racing Greyhound fraternity would have pursued it with great vigour. I have heard a dog show judge praise an over-angulated dog because it 'stood over a lot of ground'! So does a 'stretched limousine' but it requires a purpose-built construction to permit the luxury. I suppose, if a dog can win Best in Show at Crufts with a luxating patella in its right rear leg, it will be argued that anatomical soundness is not a prerequisite for show ring success. Such a worthless victory is more a commentary on judging standards than breed standards. For those who care about dogs and love their breed, physical soundness, the ability of each dog to lead a happy life and the future of the breed thankfully matter more. Freud wrote that dogs love their friends and bite their enemies, quite unlike people, who have to mix love and hate in their object relations. Shakespeare's words "...he hates him that would ...stretch him out longer" may need amending in the canine context here. But if exhibitors love winning and hate losing, then seek to please ignorant judges, the effect is the same: their dogs risk being harmed. Would I be stretching a point if I pleaded for the 'stretched limousine' of the dog world to be only a passing phase?